When you begin to follow Jesus, one of the things Jesus will do is teach you how to be. Our lives are lived to their fullest potential when we learn just to be. God's personal name is an unpronounceable four-letter Hebrew word - YHWH - and translated in the English Bible as LORD (all caps). The LORD revealed to Moses that His name means "I am that I am" (Exodus 3:14). God is the the great "I am." He is as He is. God may not be as people perceive Him; but He is who He is. God is in no need of being perceived a certain way; He is as He is. "I Am that I Am." We only know the invisible and immortal Creator God because He's condescended to our level and revealed Himself to us. Jesus is Emmanuel, "God with us." One of the things you notice about Jesus is He is who He is. Jesus doesn't change to win people over. Jesus doesn't waver at the opinions of others. Jesus is. People either love Him or hate Him, but He is who He is. He simply is. That means, we who follow Him should simply be. A Christian is. A Jesus' follower is who he is in public; he is who he is in private. We don't change because of perception or even persecution, for we are who we are, and we are learning by the grace of God to simply be. Those not filled with the love of Christ live in fear. "I don't want them to believe that I am ...." Those not resting in Christ for their identity (see Ephesians 3:19) live a life revolving around others' perceptions of them, not the reality of who they are. "I don't want you to think that I am ..."
I used to work with a person who would say, "I just don't want others on staff to think I'm disloyal to them." I reminded this staff member that he is never in control of what others think, nor is God calling him to focus on how others perceive him. I would say to him, "Just be loyal." That's enough. 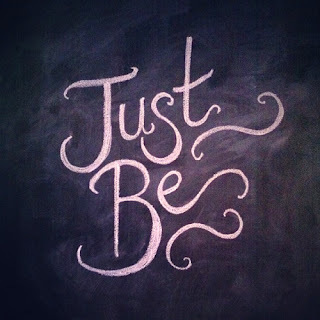 Just be. When you are filled up with all the fullness of God, you live like God lives. He is. Just be. It takes a lot of work, control and manipulation to affect the perception of others. It's what's called "Public Relations" or PR in our world. Jesus isn't in the PR business. He's in the business of teaching people how to be. Next time you find yourself more concerned with what others think of you, or how others perceive you, or where you fall on the scale of acceptance in the eyes of others, remember that those who know the great I AM live their lives by being. Just be. There is much wisdom and truth in this. It's deeper than it seems on the surface, but well worth the trouble to dig deep. It takes a lot of work, control and manipulation to affect the perception of others. So true...and even then it's impossible to change other's perception because it's true that their perception is their reality! This reminds me of a previous post you wrote that I found inspirational. "It Is Time to Get New Friends When..." I ordered Jeff VanVonderen's book Tired of Trying to Measure Up which you mentioned. Read it; gave it to a friend, and ordered another for myself. Thanks, Wade. There is much freedom and contentedness in just "being." The problem Jesus addresses with us in the struggle we mere humans face is this...we think the temporary somehow is more important than the eternal. We often trade the "perception" of the moment for the eternal that awaits us. This is where I can say that the "truth shall set you free!" When eternity comes to us one of two things will happen, we will either look back and realize what a waste of time and effort and energy that living in the moment of trying to please others was or we will anguish that we traded the truth for a lie and our eternity will be separation from God. Both can be avoided for a victorious life in Christ. “Just to be is a blessing. "Just to be is a blessing." Yes, you have no concern for what others think when you call: HELP ME! I told Judy, “Let’s play a trick: I’ll get behind and you push him over.” As I got close, I stepped on a sharp rock, stumbled and fell flat. With knee replacements, I need a chair to stand up. In between four waves that put me underwater, I kept yelling “Help me!”, but Judy thought I was playing the trick. Taking his mother’s unconcerned attitude, Keith tried to take a video. By the time Keith finally pulled me up a man on the beach had run to us. The account of God killing the sons of Aaron for making “unholy fire” always puzzled me. I’ve read several reasons of being drunk or not using the proper fire. I’ve always thought and still do it was because while everyone was flat on their faces before the presence of God, they put the importance of their religious duties of God BEFORE God. They wanted to show how important they were. I believe if their faces were on the ground, God would not have killed them. They were like a person painting the pulpit while the pastor is preaching. They were not BEING what they were supposed to BE. Tried to communicate with you through your blog but couldn't. Wonder how to get in touch? I sent a text to my step-son reminding how he and his mother ignored my cries for help in the ocean.